Hey there! I hope you all had a great Thanksgiving holiday and lots of yummy food! If you're like me, you dig into the Christmas decor as soon as the Thanksgiving meal dishes are cleaned and put away. It's festive and fun. Decorating for Christmas with my family is something I look forward to each year. I've been stocking up on decor items that I've gathered here and there for this season and wanted to give you a little sneak peek of our dining room table decor for the holidays. I've picked up some fun things on Etsy and have had so much fun putting everything together. I can't wait to share it all. I love this time of year. Spending time with family and friends, baking goodies and, of course, watching Christmas Vacation.....puts a big smile on my face. I also wanted to let you know that I've listed more walnut bread boards in my shop just in time for Christmas. If you will be ordering these for gifts, now is the time to do so in order for them to arrive in time. Walnut is something I only have available during the holiday months so these few listed will be it until next year. The photo above is my new long french walnut bread board. These are available during the holiday season. If you'd like to order, please click here. I'm looking forward to finishing up our Christmas decor and blogging about it soon! Several months ago, a sweet little cat showed up on our doorstep and we were all completely smitten with her. I blogged about her here. But after about a month, she just disappeared. We looked for her and posted flyers with the help of our neighbors but we never could find her, which left us all sad. But I realized that for the short while that she was with us, we realized that we were ready for a pet. My older boys have ALWAYS wanted a dog from the time they were small. Especially our oldest. But with kids with allergies and asthma, having pets has been something we couldn't do for most of their childhood. However, as they've grown older, they have outgrown their pet dander allergies and I've been thinking that maybe it was time. 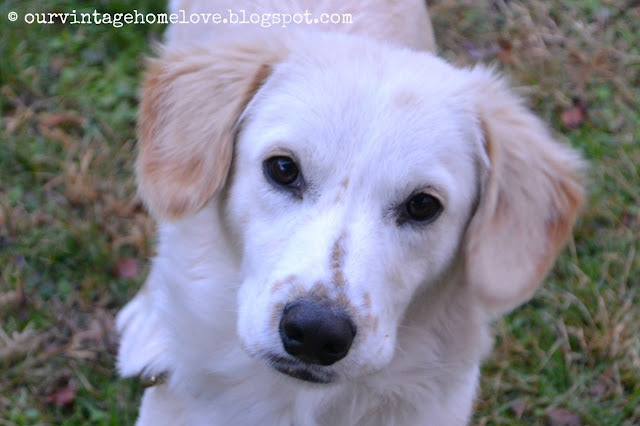 I grew up with a dog that I adored and I wanted them to have that same experience. Occasionally, I would look through our local animal shelter for just the right dog, but the dog they had in mind was never there....until this past week. We rescued him from our local animal shelter and it couldn't have been better timing. I'm one of those types of people that tries to find a meaning and purpose behind everything. Sometimes that's a good thing, sometimes it's not. Most of the time, I choose to believe it's a positive thing. When our oldest was only 3 years old (he's 20 now), his very favorite movie was Toy Story. He absolutely loved Woody and Buzz. We took him to the see the movie in the theater and he was so thrilled. A big smile planted on his sweet face through the entire movie. Then for Christmas that year, "Santa" brought him the Woody and Buzz Lightyear characters from the movie. He loved them so. 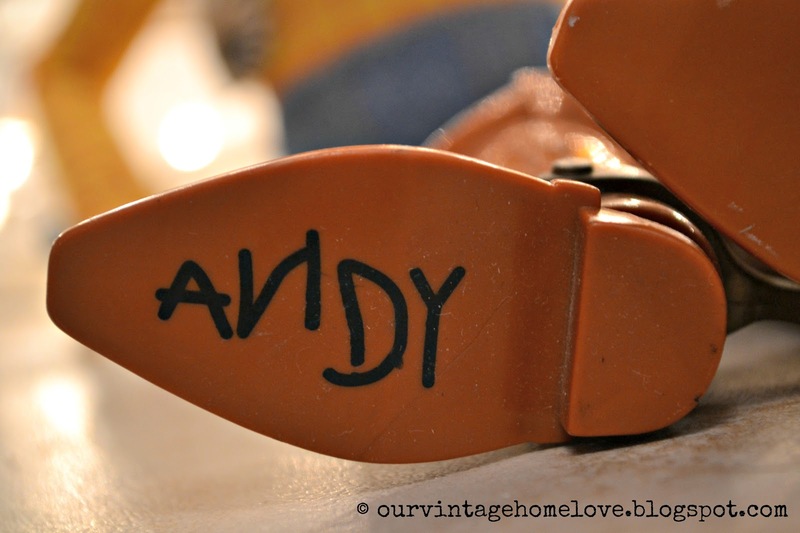 The "Andy" that was written on the bottom of Woody's boots. He thought it was the coolest thing ever. After all these years, we still have his Woody and Buzz Lightyear toys. It's funny, at 3 and 4 years old, he went around writing "Andy" on several of his other toys, instead of his own name. It's a funny, special memory that my hubby and I love to remember. So, when I was looking at all the sweet animals at the animal shelter and came across a beautiful dog named "Andy", who was also the breed our son had always wanted, I just couldn't say no. So, in a spur of the moment decision, we adopted him. Wishing you all a Happy Thanksgiving with your families!! We've spent months looking around for the perfect desk for our oldest son's room. We really wanted to find just the right one without having to spend a lot of money and since hubby is always going to storage auctions, we figured that was the best place to keep our eyes open for one. We finally hit the jackpot but it took me awhile to finally decide that it was indeed the jackpot. This is what he brought home. Neither one of us were a fan of the way it looked but it was solid wood and heavy. Plus, I liked the modern lines and knew I could do something with it. I just wasn't sure what, yet. I went through a bunch of ideas in my head and kept going back and forth on painting it or not painting it until I finally decided to completely sand it down to the raw wood. I really had my heart set on a wood desk for his room and I knew the wood could be really pretty if I gave it a makeover. I hate using stripper so I tried to sand the orangey varnish off the top first. Surprisingly, it was fairly easy to sand completely down. At this point, my plan was to paint the base and only stain the top, but after staining the top with Minwax Dark Walnut, I loved it so much I decided to sand down the entire desk. I also removed the drawer pulls and spray painted those with Rustoleum Oil Rubbed Bronze spray paint. Also hiding in storage was a vintage school desk chair that needed a bit of repair and some new castors to look as good as new. I thought it would go perfectly with the desk. Here it is in the room. I can't believe how perfectly the desk and chair go together and I didn't even plan that. :) And I love the color of the desk so much better now. Our son loves to pin things on the wall that mean a lot to him so I decided to make him a pin board with an old painting canvas that I simply covered in a coffee sack. I used bronze upholstery tacks for the "pins". The pins stick into the painted canvas perfectly. I still have a couple more things to do on the opposite side of the room before I show the full reveal. And by the way, I was having a terrible time with taking photos that day because it was raining and dreary outside and I'm still learning the manual settings on my camera. If you'd like to see the other projects in this room click here, here and here. I have had so much fun putting this room together for him and I know he is loving it which makes me so happy. I've also been working on our other boys rooms, as well, and will have some fun things to show you soon on that. Hey there! Happy Monday! 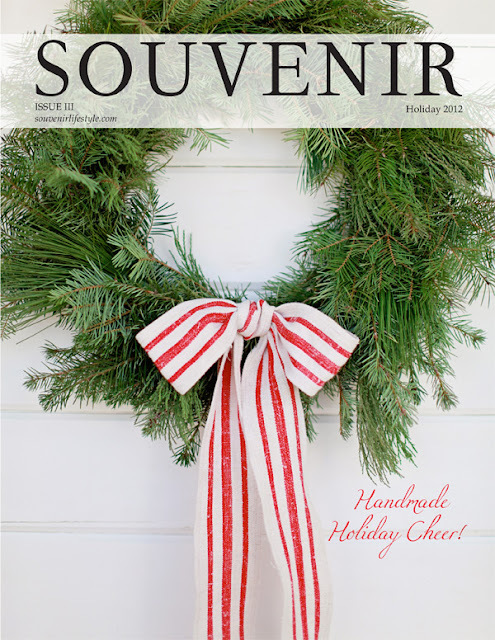 A couple of months ago, I was contacted by Melaine Thompson, the Market Editor for Souvenir Lifestyle Magazine, and she told me that my bread boards had been selected to be in the magazine as a gift idea. Well, to say I was excited is definitely an understatement. I was so honored. If you have read our blog for very long, you know how important my bread boards are to me as they are a tribute to my Dad. I was so thrilled to have them included and I know he would be, too. I am a HUGE fan of the magazine, as well as, a huge fan of all the contributors and of course, its creator, Heather Bullard. Getting to look through this magazine when it comes out each season is something I really look forward to as the photos and content are always gorgeous and inspiring. One day this past week a kind elderly lady was visiting our shop. She was quietly sifting through a crate of old Christmas ornaments, taking such care in each one that she picked up. After a few minutes, I noticed she was smiling, with tears in her eyes, and she seemed quite taken with one of the ornaments she had picked up. It also made me realize that the happiness on her face and in her heart from finding that tiny little ornament is really what makes this journey of ours so meaningful and not just a business venture. I really hope everyone that visits our shop is able to experience that happiness.....memories of kinder, gentler times are something to be treasured in our hearts and recalled often. 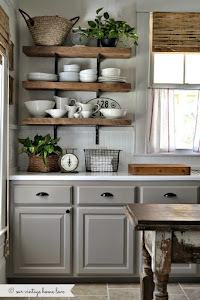 I was really inspired by this redo from Kat over at Maple Leaves and Sycamore Trees. It really turned out beautifully. She bought a table at Goodwill for only 10 bucks but then realized it was damaged. Instead of throwing it out, she completely transformed it into a gorgeous functional ottoman. So, she decided to turn it into something more functional for her family, which is awesome. She removed half of the legs and spray painted them black. Amazing! I absolutely love it, don't you?! And I'm loving that fabric. You can find out her exact step by step process and see more photos over on her blog Maple Leaves and Sycamore Trees in case you'd like to try a redo like this. Hey there! This past weekend our local downtown area had their Holiday Open House. All of the amazing businesses participated and we were thrilled to be a part of that since our shop is now located in this beautiful area. I don't know about you but I absolutely love decorating for Christmas and decorating our shop was just as much fun as decorating our home. I really wanted the Holiday decor to reflect who we are and what our shop is so I put a lot of thought into it. I really wanted to create a Christmas tree that was unique but vintage and industrial so I told my hubby to keep his eyes open on his picking trips for something that we could repurpose into a tree. He definitely didn't disappoint, though he never does. I woke up one Saturday morning to find this sitting in the back yard. At first I thought to myself 'what the heck is that doing in the back yard?' So, I asked him what it was for and he told me he thought it was the perfect Christmas tree shape. Perfect! I wrapped the entire base in white wedding lights and then attached lots of vintage Christmas and Thanksgiving post cards from 1900-1904 with tiny wooden clothes pins. Each card has actual messages written on the back from the sender and reading all the sweet sentiments from a time gone by makes them even more special. For the star, I bought two metal barn stars from our local farm store, glued them together and then cut out a small hole in the bottom with metal cutters, then inserted a small dowel rod and glued in place with hot glue. Then I inserted that into the hole that was already at the top of the base that held the part of the wind mill that blows around, and it fit perfectly. It was the perfect Christmas tree to represent our shop. For the other tree on the table, I wanted to keep it very understated, natural and simple so I placed it inside a vintage wooden egg crate, wrapped it in very wide burlap ribbon, added lights and a vintage wooden star topper. I love the look of the tree sitting in the crate. To add to the decor, I decided to make my own snow globes, so, I rummaged through our storage and found a case of old Kerr canning jars. To make the snow "globes", I sprayed the inside of the jars very lightly with spray snow and let dry. To do this, make sure to keep the jar quite a distance from the spray snow or you will end up with globs of it on the jar instead of a light mist. I placed the jars on the ground and then stood above them and sprayed, letting the "snow" fall into the jars. I found some little mini street lights in the Christmas miniatures section of the craft store. I hot glued each one to the bottom of the jar and then covered with fake snow, not the spray snow. Next I spray painted the jar lids with antique brass spray paint. To give the jars a sparkly effect, I sprayed the lids with silver skin glitter spray that I found in the Halloween costume section. After everything was dry, I drilled a small hole in the center of each lid and threaded a piece of hemp twine through the hole, knotted it, and then hung in varying heights from a very old wooden ladder that we hung from the ceiling. I absolutely loved the look. Very magical and who doesn't love tiny scenes inside jars. I also made a few with tiny white Christmas trees, also found in the same section of the craft store. You could also find these in the play train section. I had so much fun decorating but even more fun at the Open House. I spent the night before making cookies and caramel apple cider for our customers. Throughout the afternoon, we literally had 100's of people come in and we felt so blessed. It is such a joy talking with our customers and finding out what special treasures they are looking for. Finding those treasures is very important to my hubby. A very special thank you to all our customers who visited us and who continue to return to our little shop. This new adventure we are on has exceeded our wildest expectations and that couldn't have been possible without YOU. Many, many thanks!